We’re proud to announce our second supper this month. Fan favorite! 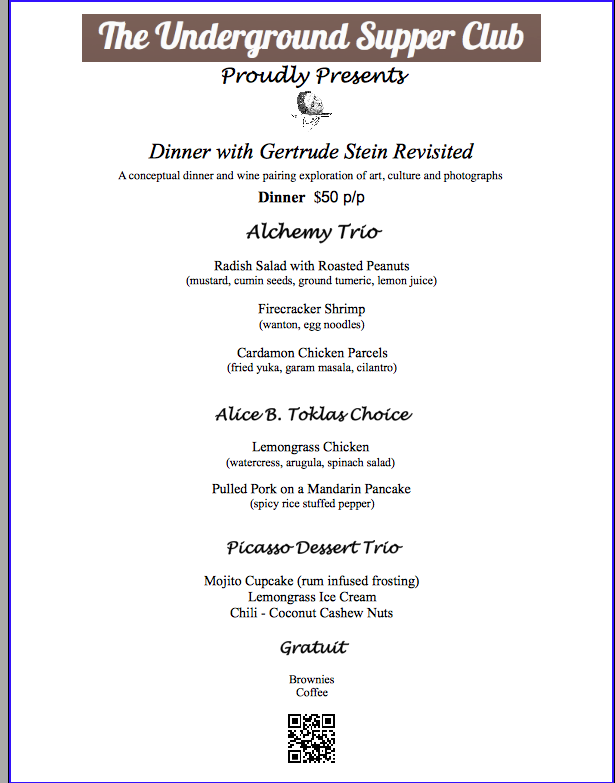 “Dinner with Gertrude Stein Revised” is our next culinary adventure. On Friday, june 29 come celebrate life, love, food, art and fun with another stellar event @ Woolpunk Studios where we fuse outstanding food, art and music together in the perfect setting for one of a kind dinner adventure. This conceptual tapas inspired menu is sure to jolt the creative spirit of foodies and art lovers alike. Dinner with Gertrude Stein Revisited is more than just a meal. It’s an experience like no other! Book soon. Seating is limited!